These brides may have met at Manhattan’s feminist-empowering WOW Cafe Theatre, but in October they had starring roles in their own production. The stage was set at Orient, Long Island’s, Poquatuck Hall with verdant lawns and sprawling trees as backdrop. And the costumes! Elegant custom-designed satin suits, Babs in cream and Betsy in seafoam. Bab’s colleague from the renowned 5 Lesbian Brothers theatre group played a supporting role, as did ring bearer Eli and flower girls Eva and Rose. Our review is in: it’s going to be a much loved, long running show! Most couples can hold out until after the I Do’s to “kiss the bride,” but not this one! 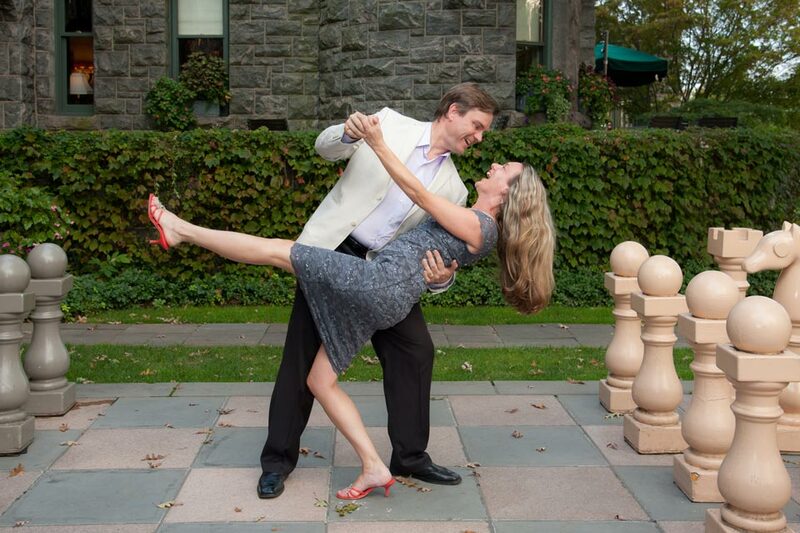 Maybe it was the idyllic setting at Chappaqua’s Crabtree’s Kittle House, but their wedded bliss certainly got an early start. Or maybe, since they met on J-Date, they couldn’t wait to prove the online-dating skeptics wrong. One thing’s for sure: this couple doesn’t waste any time; their first date was in a near-empty restaurant the day before Thanksgiving, an ideal get-to-know-you opportunity. We got plenty of our own thanks for being “kind and patient with amazing energy,” in Evelyn’s post-wedding note. You’re so welcome! Though it wasn’t Venice’s Grand Canal in the background but Tarrytown’s Hudson, Carolyn and Brian’s 20th Anniversary dinner was just as romantic. Venice was where they met, and where Brian proposed, and that city’s magic was just as evident at The Castle’s hilltop garden. From the Terrace perch, the toasts flowed as gracefully as Carolyn’s bridal veil (we got our own toast of “Wow, the photos are awesome!” soon after), and we could have sworn we saw a gondola gliding past on the river below.